The coast of Venezuela from Cabo Codera to Punto San Juan. Scale: 1 : 244,400. Larger scale plans of Puerto La Cruz, Puerto Cabello, Puerto Chichiriviche and Parque National Morrocoy, Bahia San Juan, Carabellida YC and Marina Mar, Puerto Azul, Puerto La Guaira, Ensa de Corsarios, Higuerote, Puerto Caranero, and Puerto Calera. Flat chart, water-resistant paper. 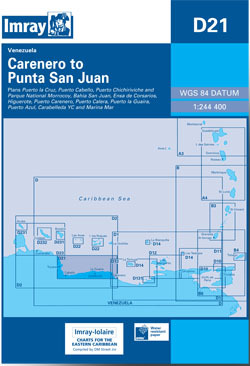 D Series Iolaire-Charts from Imray cover the Caribbean Islands north of Venezuela from Aruba to Trinidad, including the coastal waters of Venezuela.